The Monte Rosa Hut is a mountain hut located near Zermatt at the foot of Monte Rosa at an altitude of 9,169'. It is owned by the Swiss Alpine Club. The hut is the start of the normal route to the summit and other mountains in the area. The first hut was built in 1895. A completely new building was inaugurated in 2009, at an altitude of 9,458'. The first hut, known under the name Betemps hut, was built between 1894 and 1895. It had 25 beds and was owned by the Swiss Alpine Club central committee. The hut was enlarged in 1918 to host 20 more people. The Betemps hut was offered to the Monte Rosa section in 1929 then transformed and renamed Monte Rosa hut. Between 1939-1940 a new hut with 86 beds was built. The capacity was raised up to 146 in 1972 and 160 in 1984. 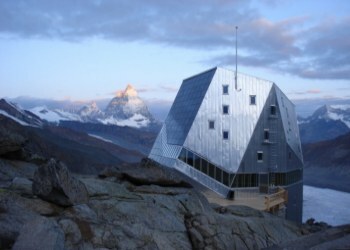 A new hi-tech environmentally friendly mountain hut was inaugurated in September 2009. The project of the Swiss Alpine Club, to mark the 150th anniversary of the ETH Z�rich, was launched in 2003. The construction materials prefabricated elements were transported by train to Zermatt and 3,000 helicopter trips were needed to take 35 workers and materials up to the glacier. The five-story crystal - shaped building was built on stainless-steel foundations with a spiral interior completely made out of wood, the exterior being covered with a silver aluminium shell. The building is designed to obtain 90 per cent of its power needs from the sun. Excess energy is stored in valve-regulated lead-acid accumulators, which guarantee power even when it is overcast. The water is produced from melting glaciers then collected and stored in a large reservoir 131 feet above the hut. Bands of windows allow the sun to heat air inside the spiral building with the redistribution of thermal energy produced by visitors. Over the next few years the hut will become a research station for the students from the ETH Z�rich. They will use it to investigate how to use energy and resources efficiently.